Few literary students will disagree that Edgar Allan Poe was one of the greatest American short story writers, particularly in the field of mystery, horror, and detective fiction. In his short life span of forty years, he produced about 70 remarkable stories, many of whom are now classics. A troubled, tormented author, Poe was born in Boston In January 1809, raised primarily by an uncle in Richmond, and died under mysterious circumstances in Baltimore in October 1849. While today, Boston ignores his birth there, both Richmond and Baltimore boast museums which are dedicated to him. 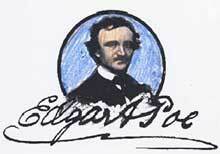 Some Poe fans are disappointed that no OTR series was ever based upon his short stories. But that is not to say that the Golden Age of Radio ignored him. A basket-full of his detective and horror stories were dramatized on network radio by a number of different series. In addition, his biography was produced on a Cavalcade of America program of 2-26-41. “The Tell-Tale Heart” starring Boris Karloff was broadcast by Inner Sanctum Mysteries on 8-3-41. Escape dramatized Poe’s story “The Fall of the House of Usher” on their 10-22-47 program. Two of Poe’s great detective stories aired in the late 40s. Family Theatre did “The Gold Bug” on 10-5-49 and on 9-17-48 NBC University of the Air broadcast “The Purloined Letter.” Peter Lorre played the lead in “”The Black Cat” which was produced by Mystery in the Air for their 9-18-47 program. All of the above programs are currently in circulation and available from OTR dealers.